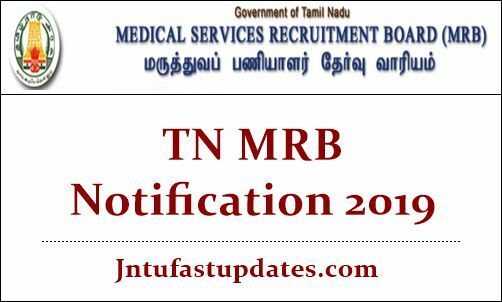 TN MRB Notification 2019: The Tamil Nadu Medical Services Recruitment Board (TN MRB) has announced Recruitment notification 2019 for 2345 Nurse Vacancies. All the Eligible Candidates Apply online mode up to 27.02.2019 for Recruitment to the post of Nurses on Contract and consolidated pay basis. For all categories Minimum Age 18 And Maximum Age 57 (ST/SCA/SC/MBC&DNC/BCM /BC), OC Age 32. Differently Abled Person Minimum Age 18 Maximum Age 57 (ST/SCA/SC/MBC&DNC/BCM/BC), OC Age 42. Candidates are required to upload their scanned copy of colour photograph and, scanned copy of signature as per the specifications given in the Guidelines for Scanning and Upload of Photograph and Signature. An online application is incomplete without the Photograph and Signature upload.